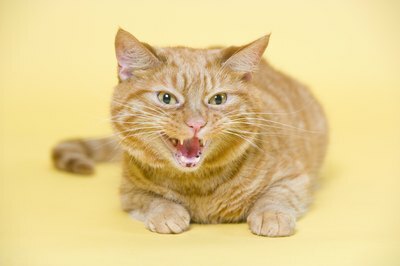 What Are Things Cats Do When They Are Angry? Knowing the signs of an angry kitty can help prevent a brawl. When your cat is angry, look out. If you don't, you might just get slapped with a tail or witness your other pet get spit at and pounced on. Kitties get angry and agitated for lots of reasons, from a lack of petting to an intruder in the house. When your feline becomes agitated, she'll often sit or lie on the ground and beat her tail on the floor or your furniture. She's essentially telling you that something has pushed her buttons and she's going through a little temper tantrum. Her tail smacking is much different than a happy dog wagging his tail. She'll often lift her tail entirely off the ground and smack it against something, or just lift the tip. If she's on all fours, she'll swing it deliberately. If your ears have been abused by a sudden hissing or screeching coming from the mouth of your kitty, she's probably very upset about something or someone. Screeching is completely different than a loud meow. It's usually more drawn out and violent sounding. Your cat will probably only hiss or screech when she's extremely upset with something or if she's in pain. The angry sounds are often a precursor to a cat fight. Some felines also let out a low guttural growl. If your kitty gets really worked up, she might spit or launch a full attack at whatever is bothering her. Like hissing and screeching, these behaviors typically won't occur if she's angry because it's not yet feeding time or because you didn't pet her. Something -- usually another animal or person -- usually has to provoke her. You'll often see physical signs that your fierce little girl is ready to leap onto something and attack it. She'll puff her entire body up, especially her tail, and arch her back end so she looks bigger. She might even walk sideways. Her ears will be erect, and she'll stare down whatever it is that set her off. Late feedings, a splash of water and a lack of attention commonly result in a bit of tail whipping from your feline. The behavior isn't serious, and she'll get over whatever bothered her in no time. Hissing, screeching, spitting and an aggressive appearance are more serious. Bringing another animal into the house can cause this behavior, as can the smell of strange animals on your clothes, strangers in your house and the appearance of animals outside. Always introduce new animals slowly, by keeping the resident cat and new animal separate for at least two to three days, then feeding them both treats when they see one another for the first time. If your cat is acting out at other people, smells or animals outside, distract her by making a sudden noise or shuffle her into another room. If a cat fight breaks out, a quick squirt of water will usually do the trick to separate the two. What Are the Dangers of a Dirty Cat Litter Box? What Shots Are Required for Dogs? What Are the Causes of Gingivitis in Stray Kittens? Are Almonds Poisonous to Cats? Do Cats Get Upset When You Leave on Vacation? Do Cats Remember Their Babies? Are Cats Irritable After Anesthesia?